The table – every dining room should have one. 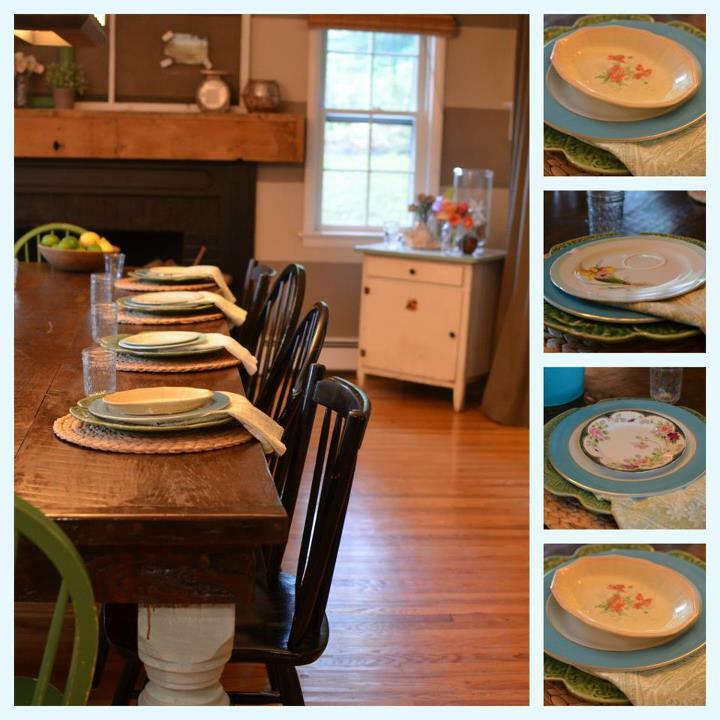 My favorite type of table is a big hunkin’ farmhouse one. I love the aged wood from the reclaimed lumber tops, mixed with all kinds of legs. My friend John Duffy, from Stable Tables specializes in making custom tables with all kinds of wood, mixed with all kinds of bases and legs. 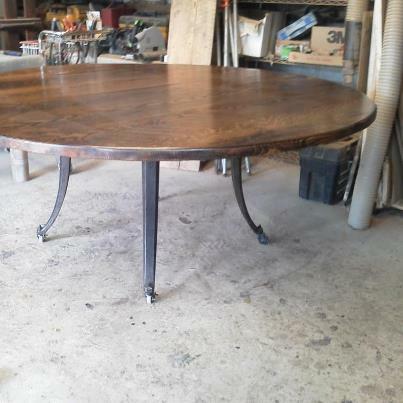 He recently made this round table with a iron knitting base for the bottom. Awesome! My dining room table was made by John about 2 years ago, and it is my favorite thing in the whole wide house! The Chairs – lot’s of them. The whole point of using my living room as a dining room was so I could have a giant room, with a giant table, and have tons of people over, and hopefully have giant plates of food (that’s edible). So, I needed chairs, chairs, and more chairs. I find them everywhere. People leave them at my back door. I find them in the trash and at yard sales. I might even purchase some from time to time. And I almost always spray paint them. Seasonally. When not in use in the dining room, I place them around the house. Bedrooms, hallways, even my powder room has a chair in it. Dishes – pretty much anything goes. I mix and match. I buy sets, partial sets, half sets, broken sets, one of a kinds, pairs, WHATEVER I like. Then I throw them all together on the table, and voila. Dinner for 72. Fun, quirky, cute, and nobody gets the impression that they need to be on their best behavior, or that anything near fancy is coming out of the kitchen. In other words, it sets the mood for the whole night. It’s eclectic, just like the people there. And that’s how I like it. 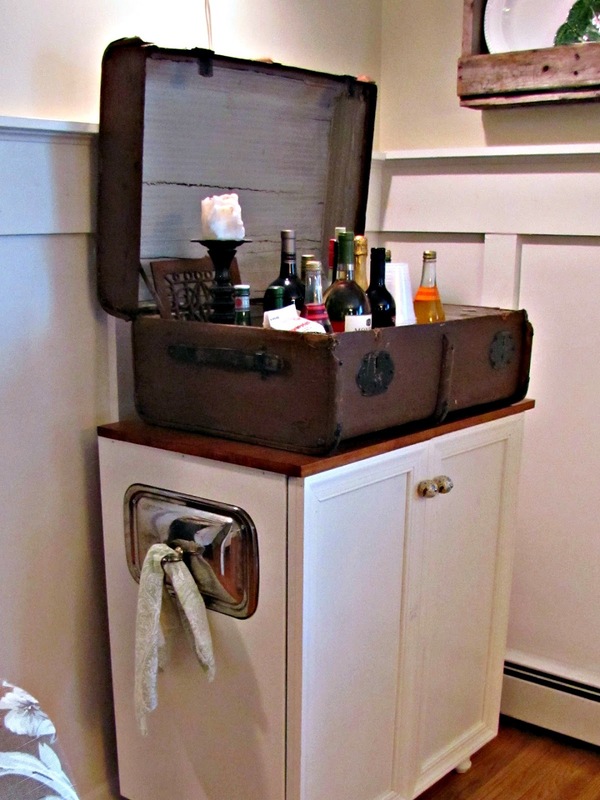 A place to put all your stuff – a buffet. If you’re like me, your not serving each person individually and plating the food like your some fancy smanchie chef. Nope. Your throwin’ it all in one spot and telling everyone to get up, cause it’s time to eat. But I will put in on/in something cool. So, while my cooking is not so hot. I can put together a mean display. Yes. I found this buffet in the trash. I know. Crazy. And don’t forget the drinks. Slap those bad boys somewhere interesting, and you’ll have your guest ewwing and ahhing all night. 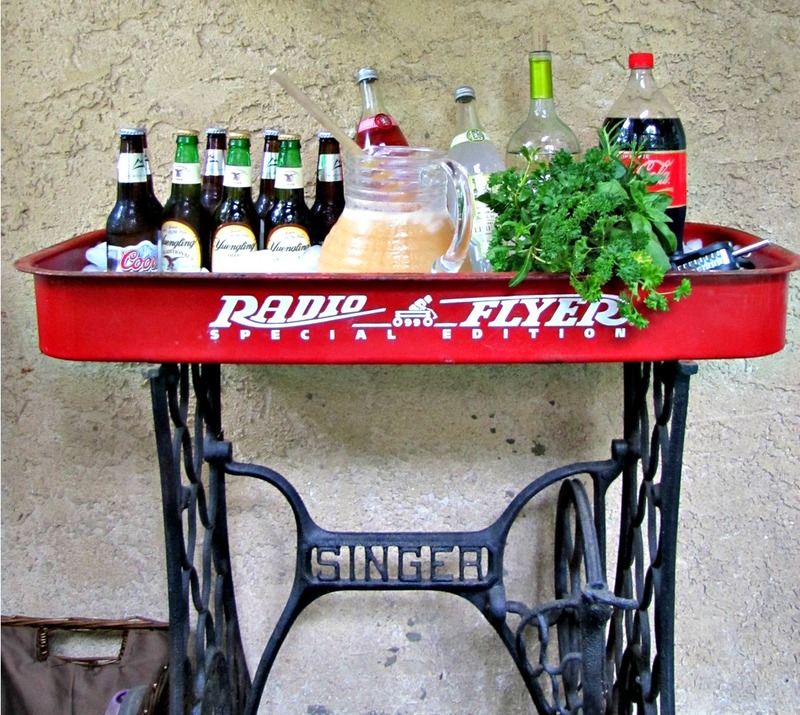 ‘Cause the bar of course is the most crowded part of the house when you’re entertaining. So, all in all these are the basic parts you’ll need to create your own “ultimate dining room”. Want more dining room ideas? 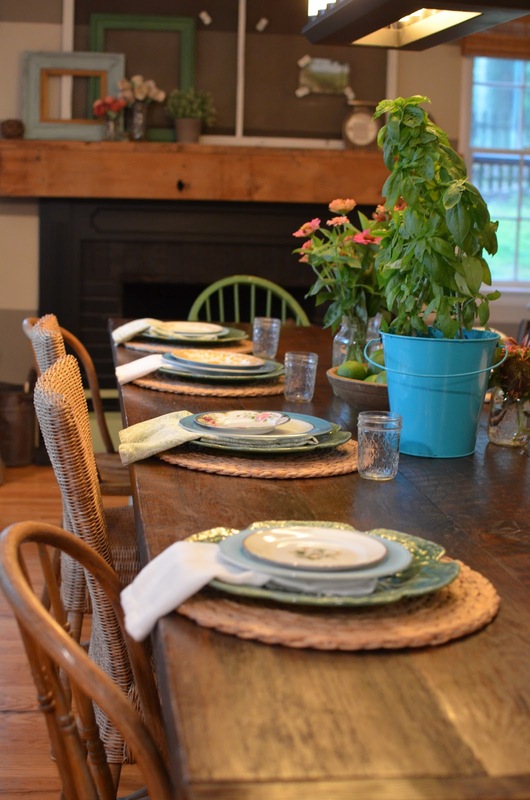 You’ll have to wait for my Flea Market Dining e-zine, which will be coming to you very soon. FREE. You’re welcome. Or, you can peek into my boards on Pinterest. Here for Thanksgiving ideas. And, here for dining rooms. I've been wanting to make my living room a dining room for years. I'd love to have a big old table like yours. go for it! I'm so happy I made the living room the dining room. We are in there more than any other room in the house. It's like a "living" dining room. But- I must say, I agree with you on the mix and match dishes. yes…it takes some clean up time in the kitchen–but it's cheaper than throw away! thank God I have a lot of sister in laws and they all chip in at clean up time, so the dished shouldn't be a problem. Your dining room looks so inviting I just want to come in, get a drink from the suitcase and set myself down in your one of a kind chairs. Your buffet is lovely. Today I will be attempting to make a vignette for my dining table and your post was full of inspiration. Thanks so much for sharing. haha!! I couldn't believe it when we found that in the trash. You should have seen it hanging out of our mini van as we drove home! Wow – you and I could be dining room design sisters…same taste, same style! Although…I have been wanting to replace my dining room chairs and haven't been able to decide on which ones. Now I think I'll just mix and match. I have quite a few around the house and in my shop as well. It looks beautiful! Thanks Shari. Go for it…mix and match!